Adventures In Stoving: Review – The Kovea Booster+1 Dual Fuel Backpacking Stove. Review – The Kovea Booster+1 Dual Fuel Backpacking Stove. The Booster+1 from Kovea is a dual fuel backpacking stove designed to work on either canister gas or white gasoline (e.g. MSR Super Fuel, Coleman Fuel, Crown Camp Fuel, etc.). The Booster+1 dual fuel stove from Kovea. Kovea is the best known stove company that you've never heard of. For several major stove brands, who's actually making the stove? Kovea. You know their products but not necessarily their name. Kovea makes either parts or entire stoves for Snow Peak, MSR, Edelrid, and Markill. I'm sure that there are others. Now, not every single stove, particularly in the case of MSR which does still make many of their own stoves, but Kovea makes at least some stoves for each of the above brands. People have noticed that this stove is the exact same stove as a stove formerly sold by Markill. Kovea has been making the stove all along. When Markill stopped selling the stove, the Markill Phoenix, Kovea started selling the stove under their own brand as the Booster+1. One of the really nice things about the Booster+1 is that you don't have to change anything when you change fuels. You don't have to swap out the jet; neither do you have to change the connector. Whether you use liquid fuel or gas fuel, the stove remains the same. Multi fuel or dual fuel? Kovea refers to the Booster+1 as a "multi" fuel stove, but to my mind a stove should work well with at least three fuels in order to get the "multi fuel" designation. I mention this because you may read reviews elsewhere that the Booster+1 can run on unleaded automotive gasoline, diesel, kerosene, etc. I would be very skeptical of such claims. It can be run on some of those fuels, but the chances of it really running well are low (based on experience), and the chances of clogging the stove are high. If you're in an area where canister gas and white gasoline are simply unavailable, choose kerosene (1-K grade) if it is available or if you're near an airport Jet A1 or Jet A will work. Leaded aviation gasoline (for propeller driven planes) and unleaded automotive gasoline should be avoided because of the tendency for the additives in the fuel to clog the stove. So also diesel should generally be avoided, but special diesel #1 ("winter diesel") can be used in a pinch; just be sure it's the special #1 and not the normal diesel #2. If you were interested in "alternative" fuels for the Booster+1, I have investigated the use of kerosene here: The Kovea Booster+1 – Multi Fuel or Just Dual Fuel? In order to use kerosene, you will need to know the priming and operational techniques discussed in this link. Again, though, canister gas and white gasoline are the recommended fuels. While you can use kerosene, the Booster+1 will not run as well on kerosene as it will on the fuels for which it was designed. If they were cheaper and you wanted to use them, you could use "panel wipe" (common in the UK) or "environmental" gasoline (gasoline without automotive engine additives) without a problem. "Sweet, light" naphtha should work also. Paint thinner, which is somewhere in between gasoline and kerosene in terms of its properties should also work, but I have not tried it. I mention some of these fuels not as a recommendation but rather as possible options for use in a pinch when more conventional stove fuels are unavailable. The Kovea Booster+1 running on kerosene. You can make do with kerosene in a pinch. See the above link for tips and appropriate technique. The Booster+1 comes in a nice boxed set. There are two versions, one with a fuel bottle included, and one without. Make sure you know which one you are getting. You will need a fuel bottle if you plan to use white gasoline. If you only plan to use canister gas, then you're all set, and you don't need to buy a fuel bottle. Either set includes a windscreen. A Kovea Booster+1 boxed set. This is the version that does not include a fuel bottle. Inside the box is a nice zippered nylon case. Inside the case is the stove. One can also place the supplied maintenance tool inside the case, but there is not room for the pump. However, I don't get too excited about this. Just keep the pump in the bottle. The fuel bottle will protect the threads and underside of the pump, and the pump will take up far less space. When the bottle is empty, don't screw down the pump tightly so that you don't wear out the gasket. The zippered nylon case of the Kovea Booster+1 has room for the stove, maintenance tool, and the spares kit. There isn't enough room for the pump, but who cares? Just keep the pump on the fuel bottle. Speaking of the pump, I regard the Kovea pump as a high quality fuel pump. The fuel pump has some nice features like a knob that is turned so that one can screw on the connector. See my review of the Kovea Hydra for details of this feature and further commentary on the pump. Since the Booster+1's pump is the same pump as the Kovea Hydra, I will not repeat all of my earlier review here. The high quality Kovea fuel pump. As I mentioned, the Booster+1 comes with a spares kit which includes things like "O" rings, a spare jet, lubricant, and a spare pump cup. It's a nice little kit, and along with the maintenance tool, should be able to handle routine maintenance as well as trouble shooting in the field. The maintenance tool for the Kovea Booster+1. Note the wire "pricker" for cleaning the jet at the end of the tool. The maintenance tool is a little on the heavy side in my opinion, but it certainly will get the job done. It would be nice to see a few grams shaved off – so long as it didn't diminish the effectiveness of the tool. The Kovea Booster+1 duel fuel backpacking stove (in folded configuration). The stove itself can only be described as beefy. I mean this thing is strong. This might be a great stove for scouts and for, say, college outdoor clubs and the like where gear tends to take a beating. Also, a number of expedition type users have reported very good results with the stove. This is a very robust, heavy duty, reliable stove that is very field maintainable. There is a cable threaded through the generator that can be pulled out and re-inserted like a pipe cleaner should the generator gum up due to poor quality fuels of the type found in remote places. The legs are very strong steel. The pot supports have a very wide span and will accommodate heavy pots for large groups or for snow melting. There is little I would worry about failing on this stove; it is strong. However, there's always a trade off on such things. Yes, the stove is extremely strong, but it is therefore consequently also fairly heavy, weighing in at 310 g/11 oz for the stove, 116 g/4 oz for the pump, and 43 g/1.5 oz for the tool. You don't absolutely have to carry the tool, and many people will just throw the stove in their pot (and leave the case at home), so let's say the minimum weight is 426 g/15 oz for just the stove and pump. Of course you'll need a bottle, but the size and brand you carry will vary, so I'm not going to try to estimate the weight here. The fuel line of the Booster+1 sticks out, rigidly, at a bit of an odd angle. There is one thing here that I find slightly irritating. It's minor, but the fuel line sticks out at a kind of funny angle, and, since the fuel line here is rigid, the stove winds up taking more space than it really needs to. It's a fairly large stove. I don't think it will be able to fit into a pot of less than about 1 liter in size. However, that's not to say that there aren't some smart features here. For example, there's a bend in the fuel line such that one can clean the jet without disassembling anything, er, well, you do have to pop off the flame spreader, but that's not exactly disassembling a stove. I mean putting on and off the flame spreader is about as difficult as opening and closing a bottle of water. There's a nicely designed bend in the fuel line so that one can access the jet easily. The Booster+1 attaches to both it's fuel pump and to a canister of gas by means of a standard 7/16ths UNEF threaded connector. The Booster+1 uses a standard threaded connector to attach to a) its fuel pump or b) standard threaded canisters. The Booster+1 is compatible therefore with standard threaded brands of canisters, for example, MSR, Jetboil, Coleman, Primus, Optimus, Brunton, Snow Peak, etc. Note that in the photo above, I am running the stove with the canister upside down. Not all stoves can handle this kind of operation, but those stoves that can operate this way gain a roughly 20 Fahrenheit degree (10 Celsius degrees) advantage over stoves in cold weather. See my article Gas Stoves in Cold Weather – Regulator Valves and Inverted Canisters for further information on cold weather and canister gas. The fuel line is nice and flexible, and it's long enough that you can stand the bottle up as you pump, letting gravity help you with your work. I find this to be a huge plus. Purging the fuel line. If you turn the fuel bottle over while the valve is still open, air will start coming down the fuel hose instead of fuel. This cleans out the fuel line so that you won't have fuel drying inside the hose leaving potentially clogging deposits behind. Clean hands. If you let all the air out by turning the fuel bottle upside down, then there's no pressure bursting out when you unscrew the pump from the bottle. With some stoves, the only way to release the pressure is to unscrew the pump while still pressurized which inevitably means that your hands are going to get sprayed with fuel as the pressure is released. The fuel line is nice and flexible which allows one to stand the bottle upright while pumping. Note that I use alcohol for priming which burns much cleaner than white gasoline and is less prone to fireballing. The fuel bottle in the photo is a Sigg brand bottle. The Booster+1 is compatible with standard Sigg type threads. At the base of each leg, there is a nice non-slip rubber pad. I found the Booster+1 to be extremely stable. Extremely. The Booster+1 is well thought out with nice features like this non-slip rubber pad on the end of each leg. Here is a photo of the Kovea Booster+1 alongside another stove I recently reviewed, the Kovea Hydra. The Kovea Booster+1, left, and the Kovea Hydra, right. Whereas the Kovea Hydra is a study in compactness, the Kovea Booster+1 is not. Indeed, if one were to compare the two stoves, one might describe them as opposites. *It is important to use a properly sized windscreen with the Kovea Hydra. See my review of the Hydra. The Booster+1 is built like a tank and will take a lot of abuse. With the Hydra, one has to be a bit more gentle. The Booster+1 is a much larger, beefier, and more powerful stove (see below chart), but it's a bit loud. The Hydra is probably the quietest liquid fueled stove that I have ever used. Here's a photo of a 2.6 L pot on the Booster+1. Note that the pot supports extend beyond the edges of the pot even though this is a fairly big pot. The Booster+1 can take some pretty big pots. A 2.6 liter pot on the Kovea Booster+1. Note how the pot supports still have more length out beyond the edges of the pot. One can put some pretty big cookware on a Booster+1. Flame control when using an upright canister of gas is excellent. A very low simmer can be easily maintained. Flame control when using an inverted canister of gas is very good but a bit trickier. A reasonably good simmer can be maintained. Flame control on white gasoline is good but not great. If one gets the stove good and hot (as would normally occur when bringing water to a boil), one can get a pretty good simmer. However, eventually the stove cools down, and the flame starts to sputter. The simmering lasts for a pretty good amount of time though and is generally better than a lot of comparable stoves that only have an at-the-bottle valve. The good news about the fuel bottle, is that Kovea uses "standard" fuel bottle threads. That is, Kovea uses the same threads as Sigg, MSR, Primus, Optimus, Snow Peak, etc. use in their fuel bottles. So, if you already have one of those brands, you should be able to use the fuel bottle you already have. HOWEVER, check to see if everything works before you head out on the trail. One time I had a Primus bottle whose threads were the same size as all of my other fuel bottles, but my MSR pump couldn't be screwed into that particular bottle. The threads on that particular bottle started too far down the neck of the bottle, and the threaded portion of my MSR pump couldn't quite attach to them. Also, make sure the fuel bottle you intend to use is long enough to accommodate the Kovea pump. As I say, hook everything up at home and test it before you head out on the trail. A Kovea fuel bottle, left. An MSR fuel bottle, right. The Kovea fuel bottle is an excellent fuel bottle, but Kovea liquid fueled stoves can use any standard threaded fuel bottle. In terms of power, the stove has plenty. I found it to be a good snow melter on liquid fuel. The Booster+1 is rated at 9600 BTU/hr on white gasoline which is about the same as an MSR Whisperlite Universal. The output on canister gas with the canister right side up (i.e. vapor feed) is considerably less, 7400 BTU/hr. However, if you invert the canister (i.e. liquid feed), BTU output will go up and will typically be higher than on white gasoline. Kovea does not provide figures for inverted canister operation, but assuming that the Booster+1 follows along the lines of other similar stoves, the rating should be about 10,500 BTU/hr. Melting snow on a Kovea Booster+1. Uh, but of course in snow, you'll want to use some kind of base lest your stove sink into the snow – and your dinner into the same. The Booster+1 needs to be used with some kind of pad or platform when in snow (just about all stoves do). 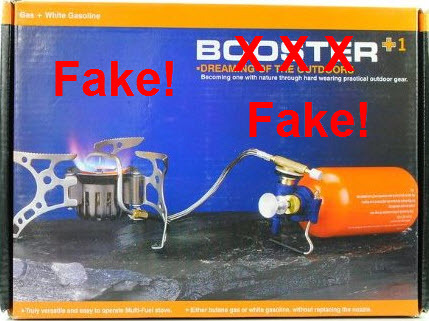 I've seen stoves that look similar to a real Booster+1, stoves that even come in a box with the same color scheme and say "Booster+1" on the side. Beware of cheap clones. Such clones are not up to mainstream manufacturing and safety standards and have been banned by several countries. Clones can be very dangerous. Recall that stove fuels are highly flammable and that there is always the risk of an explosion. Saving a few dollars is not worth it when you're risking a trip to the burn ward of a hospital – or worse. Check your source carefully and examine photos closely. My recommendation is that you buy from an authorized dealer so that you a) know that you're getting the real thing and b) have a warranty. Stoves bought on e-Bay, even if authentic, do not have a warranty. Only stoves bought from an authorized dealer have a warranty. I know that Campsaver.com carries the Booster+1, and I believe that Mass Drop occasionally offers the Booster+1 in it's "drops" (group buys), but check around. I'm sure there are other legitimate outlets for the stove. If you see it on e-Bay or Alibaba, it's not an authorized outlet, and you may not even be getting the real thing. MSRP is $170 USD, but shop around. A careful shopper need not pay full price. As I mentioned earlier, Mass Drop organizes group buys where an individual (such as yourself) can get in with a group and thereby get a group discount from the manufacturer. Similarly, many on-line retailers will sell for less than MSRP. Camp Saver had the Booster+1 for $30 off as of 21 February 2017. Word to the wise: Shop around. Loud, but not exceptionally so. Normal for this type of design. Work with a native speaker of English and re-write the instructions. The current instructions are in poor English and are difficult to understand. Lighten the stove by at least 50 grams (about 2 ounces) and preferably 75 grams. The Hexon is in this weight class, so I know that Kovea can do it. Increase thermal feedback to the generator for improved vaporization for kerosene. The current level of thermal absorption from the flame is inadequate for kerosene. A brass sleeve around and bonded to the generator might be all that is needed. I hope that the preceding text and photos will give you a good sense of the stove. By all means feel free to ask questions and make comments in the comments section, below. Warranty Information: Contact Kovea through their website (see above). The stove used in this review was provided at no cost to me by Kovea. I receive no remuneration from Kovea for my review other than I typically get to keep the stoves I review. After the first hundred stoves or so (I'm probably up to a couple hundred now), yet another stove isn't much of a big deal and has no bearing on how I write my reviews. I receive no remuneration from any seller (Mass Drop, Camp Saver, or any other) of this stove. Indeed, I have no financial relationships with any retailers of stoves. I however have purchased items as a regular member of the buying public from many retailers, just like anyone else. I mention the sellers that are herein named simply because I'm trying to tip you off on a good deal. I don't get any kick backs or anything, so it's not like I really care where you buy your stove. However, I'd feel bad if people went off and paid a high dollar amount simply because I listed said high dollar amount as the MSRP. Do NOT feel obligated to pay the MSRP listed in this review. Don't be a dunce! Shop around! Yeah, just give me one extra jet specifically for kerosene. It wouldn't be that hard. They also need to increase thermal transfer to the fuel inside the generator. Alcohol priming is the way to go with kerosene for stoves although priming paste, Hexamethylenetetramine (ESBIT), or a torch type lighter will work also. The last thing to do is to prime with kerosene itself. Yuck. Regarding fuel bottle compatibility between brands: The thread diameter and pitch are the same (at least MSR and Primus) but the thread design is NOT. MSR uses ROUNDED threads, both on the bottle and the pump (like a sine wave in cross section). I believe this is more durable. Primus uses ANGLED threads (like a triangle wave in cross section). When combined, the sharper Primus threads cut into the MSR troughs, or the MSR shallow troughs round off the sharper Primus edges. FWIW. Now with MSR fuel bottles specifically, I have a 20oz bottle stamped with 4-05 (2005) and says "Made in Canada" and a 30oz stamped with [x]-10 (2010) which says "Made in U.S.A." but my newest 30oz says "Made in China". Disappointing! But mostly disappointing because the bottle neck and thus the threads are much longer (30% more or so). Not a problem for MSR pumps. But if you like to use a Primus Ergo Pump, it means the bottom threads on the new 30oz bottle runs into the pump's brass pickup tube, and cannot be screwed in fully. I dumped out the aluminum/brass shavings out of the bottle and didn't try it again. My older MSR bottles with fewer threads and a shorter neck don't have this problem. I don't know if new MSR bottles in the other sizes have this issue. Interesting, Scott. I have a ton of old Sigg and MSR bottles, so those are what I use 90% of the time. I don't know all of the combinations I've tried, but I do remember that my MSR pump just didn't work right with a Primus bottle the one time I tried it. Thanks for the info. I'll have to keep my eyes open the next time I take one of my liquid petroleum stoves out. Got a new 20oz bottle from Amazon, was also made in China, with the longer neck. Sounds like old bottles are a better bet for compatibility (or the USA-made military ones, but they are more expensive). Hi, Scott, so this is an MSR brand bottle, but now MSR brand bottles have longer necks? Have I got that right? I have a bunch of old ones, a couple of military ones, and a bunch of Brunton ones. I'll have to see what fits what. So to clarify the Msr bottles are compatible with the Kovea booster 1 stove? Yes, absolutely. MSR bottles work on a Booster+1 just as well as a Kovea brand bottle. Thank you. By chance have you utilized the Kovea lpg adapter with this particular stove? If so how would you recommend the Coleman lpg gas bottle to be used. Can it safely be used laying down or should they strictly be used standing up? Thanks In advance for your time and advice. I haven't tried it. I would think that it would work since they're both made by the same company. I have one. Would you like me to try it out? It should be a simple enough test. Well I have tested the stove with propane and the adapter. It worked great and it simmered great as well. OK, excellent. I expected it to work, but it's really good to have confirmation. You should be able to lay the propane bottle on its side ONCE THE STOVE HAS WARMED UP. Don't lay the propane bottle on its side when the stove is cold. Let it run a minute or two first. Hi, Wyatt. I just tried it, and it fits. However, one cannot fit in a 110 g gas canister at the same time. You can fit in only the Spider or you can fit in only a 110 g gas canister, but you can't put both in simultaneously -- well at least not if you want the lid to fit on. Thanks Jim, that is a lot of help. Gas vs. Alcohol – Which is Lighter?